Payment Terms represent the time that you allow to pass between the date of an invoice and its due date / when the customer has to make a payment. In Operate, Payment Terms are managed through Standard Fields and can be customized by going to Settings > General > Customize > Accounts > Standard Fields. Search for and then click on Payment Term to get started. To add a new payment term, scroll down the payment term information screen, then click New. 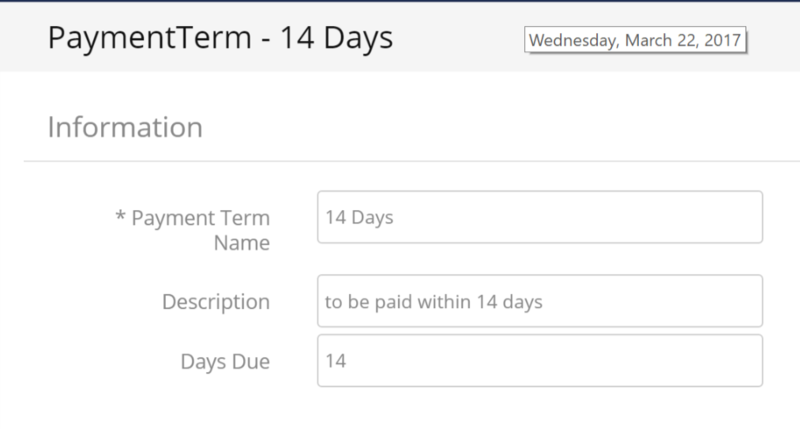 Enter payment term information by naming your term, adding a description then the number of days due. Save your changes when ready. To edit an existing payment term, click the pencil icon next to it. There are two easy ways to delete a payment term. In both cases, you will be asked to confirm your choice. Select the payment term that you want to delete, by ticking the box next to it, then click Delete on top of the list. You can use this method to delete multiple payment terms in one go, simply by ticking the boxes next to the ones you want to remove. Click the red "x" next to the payment term you want to remove. This method can only be used to delete one record at a time. To quickly update one or more payment terms in one go, select the records you want to update, by ticking the boxes next to them, then click Update at the top of the list. Using the Payment Term Text field, you can set your invoices to mention specific terms, according to the customer's chosen payment type and term and its corresponding payment term. For this you need to add a merge field to the Invoice Template you want to use. Go to Settings > General > Customiize > Accounts > Standard Fields. Search for Rental Payment Term, select it and then add or edit a payment term as shown above. Edit your Payment Term record and add your text under the Description field. Go back to Settings > General > Customiize > Accounts > Standard Fields. Search for Standard Payment Term and go through the same steps shown above for the Rental Payment Term. Go to Settings > General > Customize > Templates > Invoice Templates. Click the pencil icon next to the template you want to edit. Next, look to the left side of your template editor and under Select fields from, choose Account. Then, search for payment term text under Select Merge Field. Standard Payment Term Text inserts the text entered within the Payment Term field record selected as a Standard Payment Term on your Account record., the same way as the Rental Payment Type. Depending on the type of invoice you are editing, you can use one of these fields or both. Once you select your payment term text field, simply place your cursor wherever you want to add the field onto the template, then drag the field there. Please see below how to do so. If you need to, you can enter some text that describes the field, right onto the template. Read more about editing your Invoice Templates. Save your template when ready. Next time you use this invoice template, the text entered onto your Payment Term will appear onto the invoice itself.